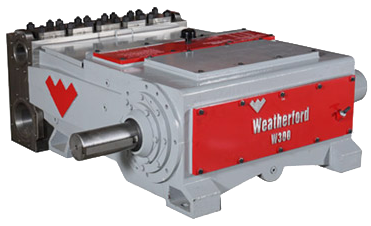 Weatherford’s Horizontal Multiplex Surface Pump is a traditional reciprocating plunger packed pump designed to basic compliance of API 674. It features pressure ranges from 500 psi to 10,000 psi, flow ranges from 0.5 to 600 GPM, and horsepower rating from 5 to 700 HP. Weatherford W-Series of reciprocating pumps is well known as a replica of the National Oilwell pump design. Critical components of the power end—crankshaft, connecting rods, crossheads, and bearings— are designed comparatively larger than industry-standard components allowing Weatherford pumps to withstand continuous-duty service in harsh operating conditions with longer service life. Most designs come with a wide range of optional bolt on gear reducers. Weatherford T-Series pumps are single-acting triplex plunger pumps rated from 5 hp to 40 hp in continuous-duty service. Technically reliable, well made, and with very competitive pricing, Weatherford pumps are readily available to meet customer’s critical deliveries. Sometimes to take a major step forward, you have to completely change directions. We wanted to use a material that could withstand the most extreme pressure pumping environments. Super Stainless™ is a state-of-the-art material offered exclusively by Kerr Pumps. This super material has the chemical properties to hold up to extreme corrosion and mechanical properties that are off the charts. This unique blend of premium stainless steel is forged to frac.